Zika virus (ZIKV), formerly a neglected pathogen, has recently been associated with microcephaly in fetuses, and with Guillian–Barré syndrome in adults, and has generated worldwide concern. Zika virus belongs to the Flaviviridae family of positive strand RNA viruses that include human pathogens such as the mosquito transmitted Dengue Virus (DENV), West Nile Virus (WNV), Japanese Encephalitis Virus (JEV), Yellow Fever Virus (YFV) and tick-borne encephalitic virus (TBEV). Zika virus was first discovered in a sentinel rhesus monkey in the Zika valley of Uganda in 1947. And subsequently isolated from mosquitos in 1948 and from humans in 1952 from Uganda and Tanzania. After that, there are only a few infected case reported in Africa and south Asia area for a long period of time until 2007 when it caused a first large outbreak of disease on Yap Island in Micronesia, followed by outbreaks in Oceania in 2013-14. Following its introduction into Brazil in 2015, the virus has spread rapidly across the Americas. In July 2015 Brazil reported an association between Zika virus infection and Guillain-Barré syndrome. In October 2015 Brazil reported an association between Zika virus infection and microcephaly. ZIKV is thought to be principally transmitted to humans through the bite of the mosquito (Aedes aegypti) vector. Sexual transmission of Zika virus is also possible. Other modes of transmission such as blood transfusion are being investigated. The incubation period (the time from exposure to symptoms) of Zika virus disease is not clear, but is likely to be a few days. The symptoms are similar to other arbovirus infections such as dengue, and include fever, skin rashes, conjunctivitis, muscle and joint pain, malaise, and headache. These symptoms are usually mild and last for 2-7 days. The illness is usually mild with symptoms lasting for several days to a week after being bitten by an infected mosquito. People usually don’t get sick enough to go to the hospital, and they very rarely die of Zika. For this reason, many people might not realize they have been infected. However, Zika virus infection during pregnancy can cause a serious birth defect called Microcephaly, as well as other severe fetal brain defects. Once a person has been infected, he or she is likely to be protected from future infections. Zika virus is enveloped, spherical, ~50 nm in diameter with an electron dense core of ~30 nm. It contain a genome of ~10.8 kb positive-sense, single-stranded RNA, and a proteome of a single polyprotein, co- & post-translationally cleaved into 11 mature proteins, mainly include E, M and C protein (Figure 1a). There are 180 copies of each of the E and associated M (‘membrane’) proteins on the virus surface; they are anchored in the bilayer lipid membrane via their transmembrane regions. The E protein is the major protein involved in receptor binding and fusion. The M protein is a small protein that is hidden under the E protein layer. The E and M proteins are organized in icosahedral symmetry consisting of 60 repeating units, and each asymmetric unit contains three individual E proteins (molecules A, B and C) (Figure. 1b). The E proteins are arranged as dimers, with three dimers lying parallel to each other forming a raft; there are 30 such rafts covering the viral surface. The E ectodomain contains three domains: DI, DII and DIII (Figure. 1b). DI acts as a bridge between DII and DIII. The tip of DII contains the fusion loop, which interacts with the endosomal membrane during fusion. The DI–DII hinge is thought to be important for flipping out DII to expose the fusion loop during the fusion event. In most other flaviviruses, DIII contains the receptor-binding site and has an important role in fusion. Figure 1. The structure of zika viral particle. The surface structure and cross-section profile are show in (a). and (b). respectively. Specimens for nucleic acid testing (NAT) testing: Whole blood, serum collected in a dry tube and/or urine collected from patients presenting with onset of symptoms ≤ 7 days. Serology (IgM detection): Whole blood collected in a dry tube and serum collected from patients presenting with onset of symptoms ≥ 7 days. Wherever possible, paired serum specimens should be collected at least 2-3 weeks apart, ideally with the first serum specimen collected during the first 5 days of illness. The presence of Zika virus may be confirmed by using NAT such as RT-PCR to detect targets on the virus genome specific for Zika virus. Laboratories using a pan-flavivirus assay in combination with gene sequencing, or other conventional molecular methodologies such as multiplex assays for flavivirus detection, are requested to ensure in-house primer sequences have been updated to detect the recent Zika virus lineages. Serological testing for Zika virus should only be conducted by laboratories with experience in performing flavivirus serology. Recommended serological assays include enzyme immunoassays (EIAs) and immunofluorescence assays (IFA) detecting IgM antibodies using viral lysate, cell culture supernatant or recombinant proteins as well as neutralization assays such as plaque-reduction neutralization tests (PRNT). Although PRNT typically provide the greatest specificity, serological assays are subject to cross-reactivity especially in patients with prior flavivirus infection or immunization history. In general, a reactive result for Zika virus IgM in the absence of IgM to dengue or other flaviviruses suggests recent exposure to Zika virus. There is no vaccine to prevent or medicine to treat Zika virus. Zika virus disease is usually mild and requires no specific treatment. People sick with Zika virus should Get plenty of rest, drink fluids to prevent dehydration. Take medicine such as acetaminophen (Tylenol®) or paracetamol to reduce fever and pain. Do not take aspirin and other non-steroidal anti-inflammatory drugs (NSAIDS) until dengue can be ruled out to reduce the risk of bleeding. If you are taking medicine for another medical condition, talk to your doctor or other healthcare provider before taking additional medication. • Sleep under a mosquito bed net if you are overseas or outside and are not able to protect yourself from mosquito bites. Microcephaly is a condition where a baby’s head is much smaller than expected. During pregnancy, a baby’s head grows because the baby’s brain grows. Microcephaly can occur because a baby’s brain has not developed properly during pregnancy or has stopped growing after birth, which results in a smaller head size (Figure 2a). Figure 2. Typical symptom of microcephaly caused by zika virus (a) and the strong neurotropism of zika virus (b). Some babies with microcephaly have been reported among mothers who were infected with Zika virus while pregnant. 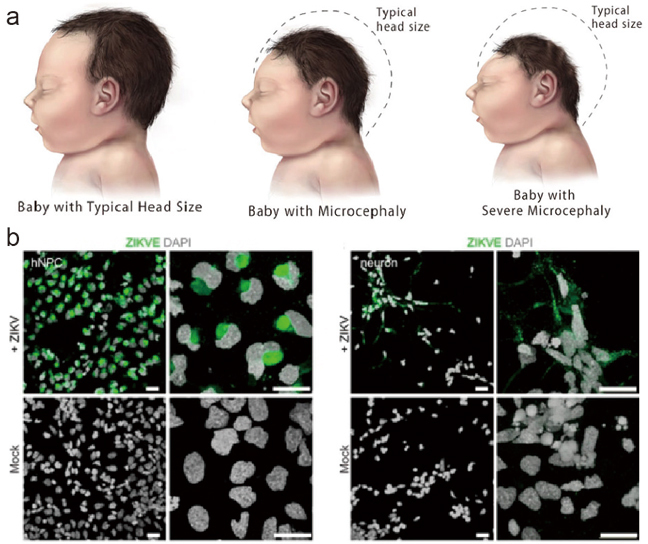 Researchers recently confirm the possible link between Zika virus infection and microcephaly (Figure 2b). Microcephaly is a lifelong condition. There is no known cure or standard treatment for microcephaly. 1. Kostyuchenko V A, Lim E X Y, Zhang S, et al. Structure of the thermally stable Zika virus[J]. Nature, 2016. 2. Sirohi D, Chen Z, Sun L, et al. The 3.8 Å resolution cryo-EM structure of Zika virus[J]. Science, 2016, 352(6284): 467-470. 3. Duffy M R, Chen T H, Hancock W T, et al. Zika virus outbreak on Yap Island, federated states of Micronesia[J]. New England Journal of Medicine, 2009, 360(24): 2536-2543. 4. Mlakar J, Korva M, Tul N, et al. Zika virus associated with microcephaly[J]. New England Journal of Medicine, 2016, 374(10): 951-958. 5. Brasil P, Pereira, Jr J P, Raja Gabaglia C, et al. Zika virus infection in pregnant women in Rio de Janeiro—preliminary report[J]. New England Journal of Medicine, 2016. 7. Tang H, Hammack C, Ogden S C, et al. Zika virus infects human cortical neural progenitors and attenuates their growth[J]. Cell Stem Cell, 2016, 18(5): 587-590.